Cheers and applause resonated inside the Sustainability Center Thursday night when it was revealed that “The Voice You Deserve” slate candidates, Diana Vicente and Mohammad “Q” Hotaki, were elected AS president and vice president for the upcoming academic year. 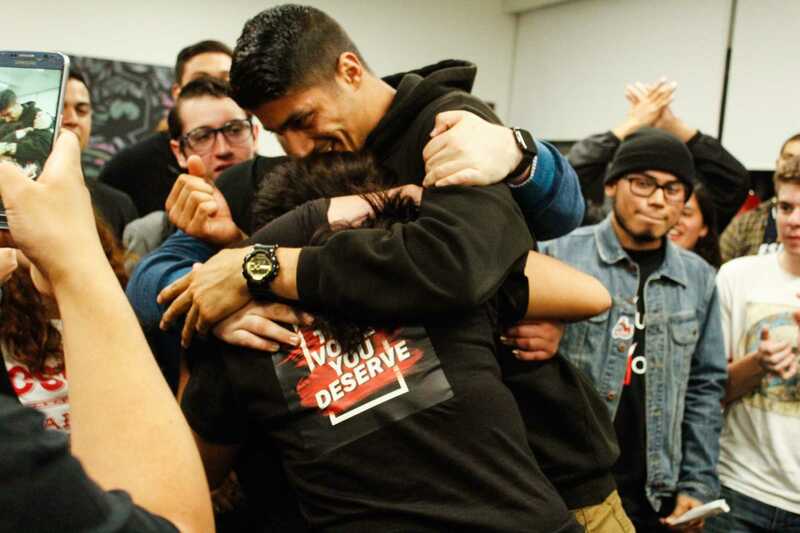 After their intense and grueling hard work, Vicente and Hotaki found themselves overjoyed after hearing they’d been elected AS president and VP. “I’m so excited, I’ve been waiting and preparing for this for a really long time and it’s here so the hard work really paid off,” Vicente said. Vice president-elect Hotaki, ecstatic with the results, credited Vicente, and his slate’s campaigning strategies and determination throughout the past two days as resourceful and expressed excitement to start this new journey for the students. “I’m so excited to take up this opportunity and I’m more than happy they’ve allowed us to have this chance to give back to them to represent a various diverse community,” said Hotaki. Zahraa Khuraibet, former AS vice president and campaign manager for “The Voice You Deserve,” expressed being proud of Vicente and Hotaki because she knew both of them were ready to take up the position and responsibility of being AS president and VP. Warren Yee, AS chair of elections, said voting had a big turnout this year compared to the 2018 elections. Out of the 33,682 students eligible to vote, 5,778 voted. The Instructionally Related Activities fee passed with 3,072 votes, the Student Health Center fee passed with 3,520 votes, and the AS fee passed with 3,421 votes. Each fee increase is a mandatory, campus-based fee which all students pay each semester. These increment in funds will help IRA, the Student Health Center, and AS in helping to support clubs and organizations, aid to keep the SHC’s physical therapy, pharmacy, and dental services, and help AS for services such as Big Show, Big Lecture, and the Farmer’s Market, according to the AS referendum document. Both Vicente and Hotaki plan to implement programs they know will benefit CSUN students, such as a book voucher program that will relieve students of financial hardship when buying school books, and just hope to do right by the students.